The scoreboard wall clock just got some fantastic updates! 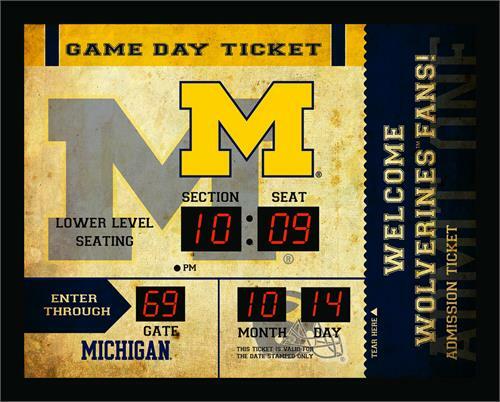 With a fresh new look and addition of a Bluetooth speaker, this Michigan Wolverines Scoreboard Clock is sure to be a quick fan favorite! Each clock comes decorated in the theme of a ticket stub where your Section and Seat display the time, your Gate displays the indoor temperature and the Month and Day display the actual month and day. Easy to use Bluetooth controls are located on the side of the frame, music projects from the front and back and can easily be enjoyed while hanging on a wall or standing on a desk. Stream your favorite music or the Big Game! This is the PERFECT addition to your home or office decor! Full color window box. Clock includes 5' long UL approved power cord. 19.75" x 1.75" x 15.75". Made by Evergreen Enterprises/Team Sports America.